When it comes to writing about food, I want to make it a learning experience. Food is so integral to culture, so I like to think of each new culinary endeavor as a reason to go on a little informational quest. This could be delving into the history of a particular ingredient, or a little background information on a particular tradition or event associated with a recipe. 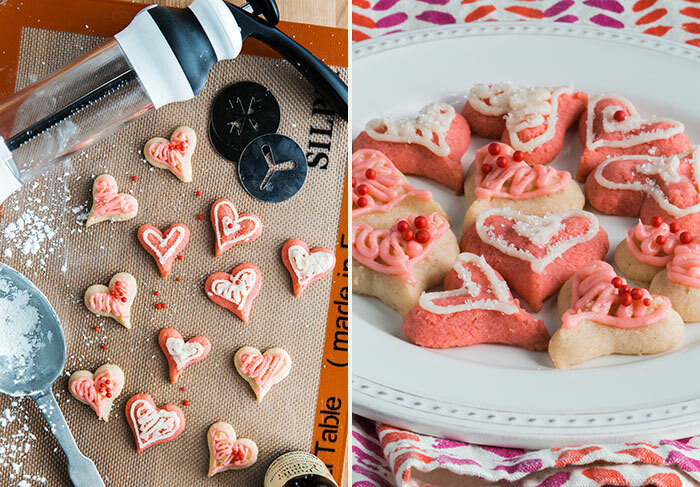 As I begin with these charming heart-shaped shortbread cookies, I thought I would do a little research on the background of some of our Valentine’s Day traditions. While feasts on St. Valentine's Day date back to ancient times, the custom of choosing a sweetheart on Feb. 14 began in the royal courts of France and England during the 14th century. Exchanging Valentines was likely limited to elites until the late-18th or 19th century. By the 1860s Valentine’s Day became the commercially profitable venture we recognize today — Victorian Britain made the exchange of ornate and expensive Valentines especially popular. And — among my favorite pieces of Valentine’s Day trivia — the Sweethearts Conversation Hearts were first devised by the New England Confectionary Company in 1866. That’s right, your great, great, (maybe even great) grandparents were probably buying the same “Be Mine” candies you can buy today. Although they couldn't buy the Spanish variation — Sweethearts En Espanol. Today, NECCO produces about a billion candy hearts a year, making it the best selling Valentine's Day candy. Now to the cookies. I used a fairly standard shortbread recipe for these cookies. My favorite part was using my new cookie press! The press is an excellent baking tool — the perfect accessory for making the kind of dainty cookies you would happily give as a gift. I also got to put my Silpat baking mat baking to work for these, which made for even baking and easy clean-up. Another important caveat, I have Celiac Disease, which I will discuss further in future posts. That means that I cannot digest gluten (the protein in wheat, rye, and barley) and that it is not included in my recipes. That said, there are a number of gluten-free flour mixes that can generally be adapted to recipes using normal wheat flour, and I based my flour mix on the "Mock Better Batter" flour that Nicole Hunn at Gluten-Free on a Shoestring adapted. 1 cup butter or margarine — let butter soften for about 30 min., but you don’t want it room temperature. In a medium bowl, cream together the butter and confectioners sugar and vanilla until smooth. These are not an especially sweet cookie, so if you’re looking to satisfy your sweet tooth, add a touch of frosting or decorative sugar. I felt that the buttery flavor of the cookies was well paired with a simple cream cheese frosting. For a colorful cookie add some food coloring to your dough. About halfway through pressing my cookies, I decided to experiment with making a pink cookie by adding a touch of red food coloring. On the cookie press: You have to get a feel for how much pressure to put on the top of the press, but once you get into a rhythm, this makes creating near-perfectly shaped cookies incredibly easy. Since gluten-free dough can tend to be stickier than glutenous doughs, I found pairing it with the Silpat’s slightly tacky texture was especially helpful in grabbing those cookies off the press. Information from my Valentine’s Day timeline is drawn from Robert W. Brower’s “Valentine’s Day,” in The Oxford Encyclopedia of Food and Drink in America (1 ed. ); “Valentine’s Day,” in A Dictionary of English Folklore; and "History of Sweethearts," at http://www.necco.com/Candy/Sweethearts/History.aspx. With the first month of 2014 behind me, I have to pause and consider all of the new ventures that have already begun this year. January marked my first story in a national magazine. Stephen, my talented photographer husband, and I had the opportunity last fall to go to Columbus, OH and do a series of stories for freshstyle magazine — a new publication from Hoffman Media. While there we got to meet the creative guys behind Tomorrow's Antiques — a custom carpentry shop in the Short North neighborhood where they incorporate repurposed items in their creations. The story on Tomorrow's Antiques marked the beginning of an ongoing relationship with freshstyle, and I'll be blogging for them a couple times a month. My first post focused on the importance of actually beginning a new undertaking, rather than over thinking all of possible repercussions. I'll be blogging about our travels, gluten-free baking, and other arts and crafts projects in the future. January also brought my first feature in Birmingham Magazine, where I wrote on the past and present of the city's steel and iron industry. This project started last summer, and I loved watching each piece of it come into place. I especially enjoyed interviewing people whose lives have been connected to the industries that made the Magic City. It is probably the most rewarding piece of freelance writing I have worked on to date. There is nothing quite like digging into an element of your city and finding a deeper, more meaningful connection to your home because of it. January offered a strong start to 2014 and I'm excited to see what the rest of year has in store. There is something intimidating about that white box, sitting there empty, devoid of words — a white box that I am somehow supposed to fill with words. Getting started is always the hardest part for me. Maybe Vince Gilligan, the creator of Breaking Bad, had it right when he told GQ that "Writing is like getting hit in the head repeatedly with a mallet." Sometimes it feels like that, especially when in the throws of a long project that requires daily output. Mostly, though, I feel compelled to write as an outlet, a way to sort through my thoughts and ideas, and help settle them into place. The thoughts on writing that have stayed with me the longest come from writer Gabriel Josipovici whose works of fiction and nonfiction use writing as a method for exploring questions without demanding a perfect solution. Asking the question becomes the purpose, and a number of thoughtful, if only partial answers come along the way. For me writing does not serve as the perfectly formed synthesis, but as a process for untangling the the various problems of life. There is a pace, a slowness that comes with finding the right words and making them stand in for fleeting ideas. Those pesky ideas that seemed so stable in my head often seem to nearly lose substance as I fix them to the page. Writing means going over, and over it again, searching for the right expression. Perhaps I am merely putting a magnifying glass on the struggles we all confront. So much of our lives concern writing — from emails, to text messages, social media, blogs, and the myriad of other online forums, we are constantly writing. We have sat pondering the right way to express ourselves, hoping we choose the right words with the right inflection. As a medium, the written word derives its very usefulness from its limitations. In a few strokes of the pen or pecks at the keyboard and we have delineated an idea, a thought, an image. We leave it to the reader to form their own ideas based on those scratches onto the once blank page. I have focused my site on asking questions so that I might then break apart their various implications. I do not pretend to arrive at complete answers, but here I can ask questions that occur to me as I go through life, and collect them in a place where they might become part of a conversation. My hope is to ask those questions in a number of ways — from constructing a recipe, to piecing together a pattern, to working out the details of a writing project. With each endeavor, I hope to add some substance to day-to-day activity.